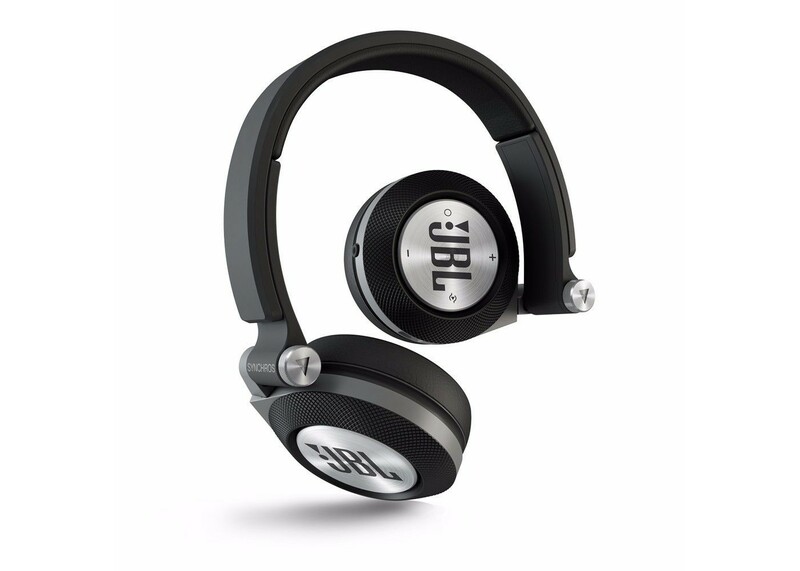 Next Generation, on-ear stereo headphones featuring JBL’s legendary sound, Bluetooth® connectivity with ShareMe™ music sharing, all in a stylish, contemporary design. Bask your ears in bold JBL sound: large 40mm drivers with PureBass performance envelop your ears, delivering an expansive soundstage with clarity and precision. Bluetooth® technology allows wireless connectivity with your smart devices, with single-button access to JBL Pure Konnexx™ technology enabling a pure connection to your wireless device for clear hands free calling. Integrated ShareMe™ lets you take your music social, allowing you to stream music wirelessly to another ShareMe™-equipped headphone. And a built-in rechargeable lithium-ion battery keeps the sound going with 16 hours of uninterrupted play time. The ergonomic headband and 3D hinges provide for long lasting comfort. Soft, leatherette ear cups cradle your ears for all-day comfort while providing a heightened level of passive noise reduction. The E40BT’s sleek design and five unique color combinations make a visual statement that’s as striking as the sound. Bluetooth-enabled technology for wireless calling and music play. Built-in ShareMe™ technology allows you to share your content with another set of headphones, simultaneously. Built-in, USB rechargeable lithium-ion battery provides 16 hours of uninterrupted listening. And when the battery dies, the included aux cable allows for passive listening. Ear-cup-based microphone with Pure Konnexx™ echo-cancelation technology allows for hands-free calling with a pure connection to your wireless device for clear, hands free calling. JBL signature sound with PureBass performance and premium 40mm drivers deliver full spectrum sound with uninhibited clarity and powerful bass. Ergonomic headband and protein leather ear-cushions provide an ultra-comfortable fit and effective noise isolation. Assertive, contemporary styling in five color combinations. Bluetooth®-enabled technology for wireless calling and streaming music play. Built-in ShareMe™ technology allows simultaneous, wireless music-listening among 2 ShareMe™- equipped headphones. The E40BT is a stylish, wireless headphone that is the perfect complement to a smart device or tablet. It’s also a social hub: activate ShareMe™ with the touch of the ear cup and stream your music to another ShareMe™-enabled headphone. The E40 is a “concert for 2”. Listen all day, charge at night. The built-in rechargeable Li-ion battery powers the E40 for a generous, best-in-class 16-hours of play time. And on the occasion that you find yourself without power, use the included 3.5mm aux cable to play passively. Also included, a micro USB cord for recharging. Ear-cup-based microphone with Pure Konnexx™ echo-cancelation technology for handsfree calling with clear voice transmission. The E40BT keeps you connected, not tied down. Seamlessly shift from music listening to a phone call at the touch of a button. Speak wirelessly via the built-in microphone and experience pure, clear connection thanks to Pure Konnexx™ echo-cancelation technology. JBL SIGNATURE SOUND with PureBass performance and premium 40mm drivers delivers full spectrum reproduction with uninhibited clarity and powerful bass. The E40BT delivers uncompromising highs and expansive lows; performing at a high level, it reproduces a wide frequency response from 10Hz to 24kHz. The large drivers combine with JBL’s PureBass performance to guarantee a dynamic, undistorted listening experience – Hear the Truth. Ergonomic headband and textured, leatherette ear-cushions provide an ultra-comfortable fit and effective noise isolation. The lightweight, ergonomically designed headband with soft, leatherette ear cushions cradle your ears for all-day listening comfort, while shutting out noise from the outside world. 3D, aluminum swivel hinges align the ear pad for the perfect fit and ultimate wearability. Head turning, the E40BT’s contemporary design and five fresh color choices make a bold statement.